Learn why deAzzle came into existence and understand how we helping SME businesses across India. deAzzle platform is a facility which helps to directly connect the local businesses to consumers, which helps make the purchase process simpler, faster & efficient. 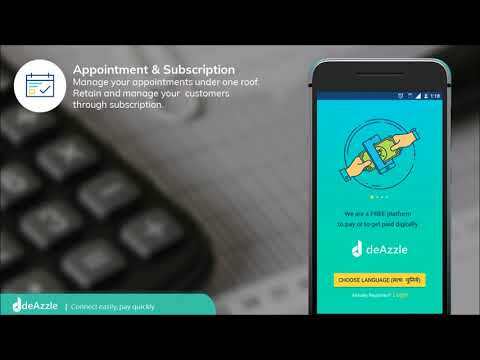 deAzzle is the most-trusted business solution provider to connect to your customers by facilitating hassle-free interaction right from booking appointments to collecting payments, we make this possible by providing a unique and powerful online business solution to run your business anytime from anyplace. What we believe at deAzzle? A company that is set up with a Vision of being able to help the small businesses by helping them get their business digital. We are trying to solve the gap between the sellers and services they offer. The biggest challenge faced by the SME sector is that they are not tech savvy, and is the least tech advanced sector, despite being the primary engine of the economy and is a very cash dependent economy. Our Mission is to help get the SME’s digital, by making people initiate more digital transactions over cash, which in turn makes them more efficient in the business, and thus grow their business. With deAzzle We aim to automate and create an ecosystem which will enable and empower SMB’s across India, and will in turn help digitization the country, and make us a tech enabled country. deAzzle is the next fast-growing company. deAzzle has successfully helped over 3000 businesses across Pune with managing their daily functioning. deAzzle aims to help many more such businesses and has started spreading its wings outside of Pune as well to help many such businesses. deAzzle helps all SMB entrepreneurs to come digital and go cashless. We aim to help all small businesses by giving them a solution to their daily operational problem. We have got good success and are looking forward to take this across India. Download deAzzle for mobile NOW! If you wish to grow, expand your knowledge, and take the next BIG step towards your career goals, join the dynamic team at deAzzle. Get in touch by clicking the link here and submitting the application form.